Did you know cauliflower is packed with antioxidants? Research suggests cruciferous vegetables, like cauliflower, can prevent prostate, colorectal, and lung cancers. Swap out potatoes in favor of this vegetable side. You’ll be surprised by how close it tastes to true mashed potatoes. Break cauliflower into small pieces. In a good-sized saucepan, steam cauliflower, garlic and leeks in water until completely tender, about 20 to 30 minutes. While cauliflower is hot, puree until the vegetables resemble mashed potatoes. Use a food processor, or if you prefer a smoother texture, use a blender. Process only a small portion at a time, holding the blender lid on firmly with a towel. Add a little hot water if vegetables seem dry. Stir in margarine and pepper to taste. So, how did they turn out? 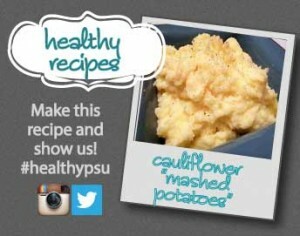 Tag #healthypsu on Twitter or Instagram with a photo of your Cauliflower Mashed “Potatoes” for a chance to become the featured image on the blog.